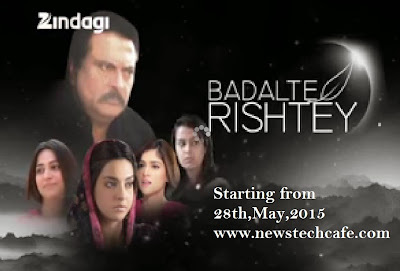 'Badalte Rishtey' is an Upcoming Urdu Entertainment Serial on Zindagi Tv India's which is Starting from 28th,May,2015 .Zindagi Tv is Popular for telecasting Pakistani Serials in India in New Look and Feel. This New Tv Show Story is written by Mansoor Mushtaq and this show is directed by Zeeshan Ahmed . 'Badalte Rishtey' Zindagi Tv serial is produced by Hasan Zia. In Pakistan,this Tv serial was named as Kissey Apna Kahein and aired on Hum Tv Entertainment. Danish Taimoor & Iraj Fatima and Shabbir Jan playing lead role in this show and this serial is one of the most popular Tv Shows in Pakistan. “Badalte Rishtey” highlights the situation of a middle-class family. The story of the serial revolves around a father who loves his four daughters and takes decisions for their bright future. But Unfortunately his decisions for his daughters turn out to be all wrong. “Badalte Rishtey” focuses on human psychology, greed, love and problems existing in our society. The story snowballs into heavy-duty drama as it reaches the culmination point and in every episode you are met with aspiring moments. Shabbir Jan ,Danish Taimoor and Iraj Fatima will be seen in Lead Role in this show. This show is expected to be Launched from 28th,May,2015.